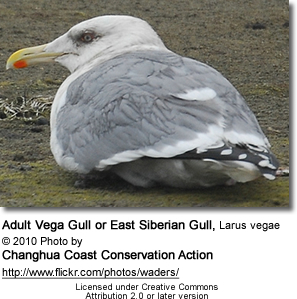 The Vega Gull or East Siberian Gull, Larus vegae, is a large gull of the Herring Gull/Lesser Black-backed Gull complex which breeds in North-east Asia. Its classification is still controversial and uncertain. It is variously treated as a separate species, as a subspecies of American Herring Gull (L. smithsonianus) or included with both the American Herring Gull and European Herring Gull in L. argentatus. The Mongolian Gull, Larus (vegae?) mongolicus, has previously been regarded as a subspecies of the Caspian Gull (L. cachinnans) but is now sometimes lumped with the Vega Gull. 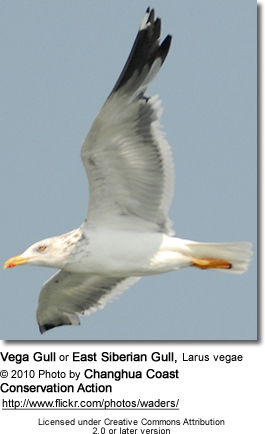 The Vega Gull is similar to the Herring Gull but is slightly darker grey above. The head is heavily streaked with brown in winter, especially on the back and sides of the neck forming a collar. The legs are usually bright pink. Eye colour is variable but tends to be dark with a red orbital ring. There are rarely any dark marks on the pale yellow bill. Vega Gulls in the north-western part of their breeding range are paler above. They are sometimes considered to form a separate subspecies Larus vegae birulai (Birula's Gull). The back and wings of the Mongolian Gull vary in colour. They are often medium grey similar to Birula's Gull but can be much darker. The head is mainly white all year round with only faint winter streaking. The legs are usually pink and the eye is usually pale with a red orbital ring. The bill is yellow with a large red spot and often with dark markings. 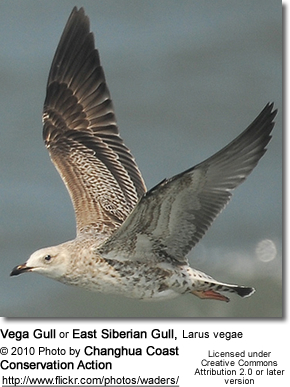 Vega Gulls breed in north-east Siberia and winter in Japan, Korea, south and east China and Taiwan. They are regularly seen on St. Lawrence Island and Nome, Alaska and may breed there. There are also records from other parts of western Alaska, and a few photo documented records from Washington and California. In their winter range they are typically found in harbours, on rocky shores and at river mouths. 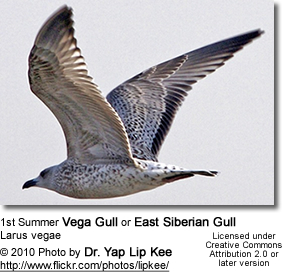 The Mongolian Gull nests in Mongolia, neighbouring parts of Russia (such as Lake Baikal), north-east China (e.g. Lake Hulun) and possibly South Korea. It migrates south-east to winter in south and east China and Korea with small numbers reaching Japan. 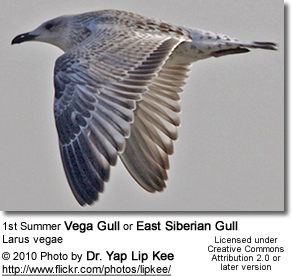 In South Korea it winters on inland waters more often than the Vega Gull.